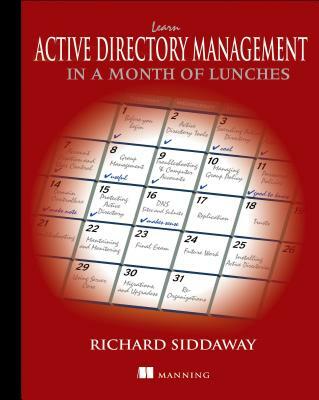 Learn Active Directory Management in a Month of Lunches is a practical, hands-on tutorial designed for IT pros new to Active Directory. It skips the theory and concentrates on the day-to-day administration tasks you need to know to keep your network running smoothly. Just set aside an hour a day for a month--lunchtime would be perfect--and you'll be comfortable and productive with Active Directory before you know it. At the heart of your Windows network is Active Directory, the control center for administration, security, and other core management functions. If you're new to Active Directory administration--or if you find yourself unexpectedly thrust into that role--you'll need to get up to speed fast. Learn Active Directory Management in a Month of Lunches is a hands-on tutorial designed for IT pros new to Active Directory. Without assuming previous administration experience, the book starts by walking you through the most important day-to-day system management tasks. You'll learn how to administer AD both from the GUI tools built into Windows and by using PowerShell at the command line. Along the way, you'll touch on best practices for managing user access, setting group policies, automating backups, and more. Richard Siddaway is an experienced all-around Windows administrator with two decades of experience. He's the author of PowerShell in Practice andPowerShell and WMI, and coauthor of PowerShell in Depth.